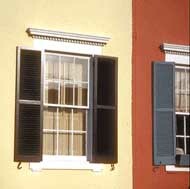 The windows on many historic buildings are an important aspect of the architectural character of those buildings. Their design, craftsmanship, or other qualities may make them worthy of preservation. This is self-evident for ornamental windows, but it can be equally true for warehouses or factories where the windows may be the most dominant visual element of an otherwise plain building. Evaluating the significance of these windows and planning for their repair or replacement can be a complex process involving both objective and subjective considerations. The Secretary of the Interior's Standards for Rehabilitation and the accompanying guidelines, call for respecting the significance of original materials and features, repairing and retaining them wherever possible, and when necessary, replacing them in kind. This Brief is based on the issues of significance and repair which are implicit in the standards, but the primary emphasis is on the technical issues of planning for the repair of windows including evaluation of their physical condition, techniques of repair, and design considerations when replacement is necessary. 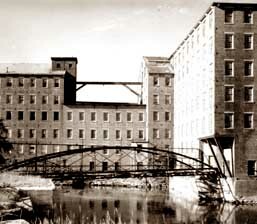 Windows are frequently important visual focal points, especially on simple facades such as this mill building. Replacement of the multi-pane windows with larger panes could dramatically alter the appearance of the building. Photo: NPS files. 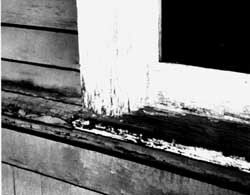 Deterioration of poorly maintained windows usually begins on horizontal surfaces and at joints, where water can collect and saturate the wood. Photo: NPS files. Before undertaking any of the repairs mentioned in the following sections all sources of moisture penetration should be identified and eliminated, and all existing decay fungi destroyed in order to arrest the deterioration process. Many commercially available fungicides and wood preservatives are toxic, so it is extremely important to follow the manufacturer's recommendations for application, and store all chemical materials away from children and animals. After fungicidal and preservative treatment the windows may be stabilized, retained, and restored with every expectation for a long service life. This historic double-hung window has many layers of paint, some cracked and missing putty, slight separation at the joints, broken sash cords, and one cracked pane. Photo: NPS files. 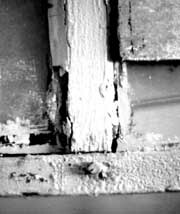 After removing paint from the seam between the interior stop and the jamb, the stop can be pried out and gradually worked loose using a pair of putty knives as shown. Photo: NPS files. Sash can be removed and repaired in a convenient work area. Paint is being removed from this sash with a hot air gun. Photo: NPS files. The final glazing compound or putty is applied and beveled to complete the seal. The sash can be refinished as desired on the inside and painted on the outside as soon as a "skin" has formed on the putty, usually in 2 or 3 days. Exterior paint should cover the beveled glazing compound or putty and lap over onto the glass slightly to complete a weather-tight seal. After the proper curing times have elapsed for paint and putty, the sash will be ready for reinstallation. 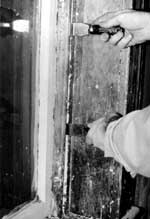 Following the relatively simple repairs, the window is weathertight, like new in appearance, and serviceable for many years to come.Photo: NPS files. The operations just discussed summarize the efforts necessary to restore a window with minor deterioration to "like new" condition. The techniques can be applied by an unskilled person with minimal training and experience. To demonstrate the practicality of this approach, and photograph it, a Technical Preservation Services staff member repaired a wooden double-hung, two over two window which had been in service over ninety years. The wood was structurally sound but the window had one broken pane, many layers of paint, broken sash cords and inadequate, worn-out weatherstripping. The staff member found that the frame could be stripped of paint and the sash removed quite easily. Paint, putty and glass removal required about one hour for each sash, and the reglazing of both sash was accomplished in about one hour. Weatherstripping of the sash and frame, replacement of the sash cords and reinstallation of the sash, parting bead, and stop required an hour and a half. These times refer only to individual operations; the entire process took several days due to the drying and curing times for putty, primer, and paint, however, work on other window units could have been in progress during these lag times. 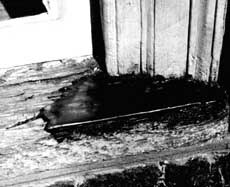 This illustrates a two-part expoxy patching compound used to fill the surface of a weathered sill and rebuild the missing edge. When the epoxy cures, it can be sanded smooth and painted to achieve a durable and waterproof repair. Photo: NPS files. Wood may also be strengthened and stabilized by consolidation, using semirigid epoxies which saturate the porous decayed wood and then harden. The surface of the consolidated wood can then be filled with a semirigid epoxy patching compound, sanded and painted. Epoxy patching compounds can be used to build up missing sections or decayed ends of members. 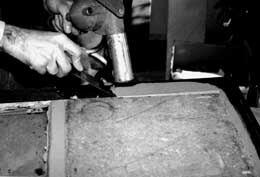 Profiles can be duplicated using hand molds, which are created by pressing a ball of patching compound over a sound section of the profile which has been rubbed with butcher's wax. This can be a very efficient technique where there are many typical repairs to be done. The process has been widely used and proven in marine applications; and proprietary products are available at hardware and marine supply stores. Although epoxy materials may be comparatively expensive, they hold the promise of being among the most durable and long lasting materials available for wood repair. More information on epoxies can be found in the publication "Epoxies for Wood Repairs in Historic Buildings," cited in the bibliography. When parts of the frame or sash are so badly deteriorated that they cannot be stabilized there are methods which permit the retention of some of the existing or original fabric. These methods involve replacing the deteriorated parts with new matching pieces, or splicing new wood into existing members. The techniques require more skill and are more expensive than any of the previously discussed alternatives. It is necessary to remove the sash and/or the affected parts of the frame and have a carpenter or woodworking mill reproduce the damaged or missing parts. Most millwork firms can duplicate parts, such as muntins, bottom rails, or sills, which can then be incorporated into the existing window, but it may be necessary to shop around because there are several factors controlling the practicality of this approach. Some woodworking mills do not like to repair old sash because nails or other foreign objects in the sash can damage expensive knives (which cost far more than their profits on small repair jobs); others do not have cutting knives to duplicate muntin profiles. Some firms prefer to concentrate on larger jobs with more profit potential, and some may not have a craftsman who can duplicate the parts. A little searching should locate a firm which will do the job, and at a reasonable price. If such a firm does not exist locally, there are firms which undertake this kind of repair and ship nationwide. It is possible, however, for the advanced do-it-yourselfer or craftsman with a table saw to duplicate moulding profiles using techniques discussed by Gordie Whittington in "Simplified Methods for Reproducing Wood Mouldings," Bulletin of the Association for Preservation Technology, Vol. III, No. 4, 1971, or illustrated more recently in The Old House, Time-Life Books, Alexandria, Virginia, 1979. Many styles of storm windows are available to improve the thermal performance of existing windows. The use of exterior storm windows should be investigated whenever feasible because they are thermally efficient, cost-effective, reversible, and allow the retention of original windows (see "Preservation Briefs: 3"). Storm window frames may be made of wood, aluminum, vinyl, or plastic; however, the use of unfinished aluminum storms should be avoided. The visual impact of storms may be minimized by selecting colors which match existing trim color. Arched top storms are available for windows with special shapes. Although interior storm windows appear to offer an attractive option for achieving double glazing with minimal visual impact, the potential for damaging condensation problems must be addressed. Moisture which becomes trapped between the layers of glazing can condense on the colder, outer prime window, potentially leading to deterioration. The correct approach to using interior storms is to create a seal on the interior storm while allowing some ventilation around the prime window. In actual practice, the creation of such a durable, airtight seal is difficult. Consider energy efficiency as one of the factors for replacements, but do not let it dominate the issue. Energy conservation is no excuse for the wholesale destruction of historic windows which can be made thermally efficient by historically and aesthetically acceptable means. In fact, a historic wooden window with a high quality storm window added should thermally outperform a new double-glazed metal window which does not have thermal breaks (insulation between the inner and outer frames intended to break the path of heat flow). This occurs because the wood has far better insulating value than the metal, and in addition many historic windows have high ratios of wood to glass, thus reducing the area of highest heat transfer. One measure of heat transfer is the U-value, the number of Btu's per hour transferred through a square foot of material. When comparing thermal performance, the lower the U-value the better the performance. According to ASHRAE 1977 Fundamentals, the U-values for single glazed wooden windows range from 0.88 to 0.99. The addition of a storm window should reduce these figures to a range of 0.44 to 0.49. A non-thermal break, double-glazed metal window has a U-value of about 0.6. Technical Preservation Services recommends the retention and repair of original windows whenever possible. We believe that the repair and weatherization of existing wooden windows is more practical than most people realize, and that many windows are unfortunately replaced because of a lack of awareness of techniques for evaluation, repair, and weatherization. Wooden windows which are repaired and properly maintained will have greatly extended service lives while contributing to the historic character of the building. Thus, an important element of a building's significance will have been preserved for the future. ASHRAE Handbook 1977 Fundamentals. New York: American Society of Heating, Refrigerating and Air-conditioning Engineers, 1978 (chapter 26). Ferro, Maximillian. Preservation: Present Pathway to Fall River's Future. Fall River, Massachusetts: City of Fall River, 1979 (chapter 7). "Fixing Double-hung Windows." Old House Journal (no. 12, 1979): 135. Morrison, Hugh. Early American Architecture. New York: Oxford University Press, 1952. Phillips, Morgan, and Selwyn, Judith. Epoxies for Wood Repairs in Historic Buildings. Washington, DC: Technical Preservation Services, U.S. Department of the Interior (Government Printing Office, Stock No. 024016000951), 1978. Rehab Right. Oakland, California: City of Oakland Planning Department, 1978 (pp. 7883). "Sealing Leaky Windows." Old House Journal (no. 1, 1973): 5. Weeks, Kay D. and David W. Look, Preservation Brief 10: Exterior Paint Problems on Historic Woodwork. Washington, DC: Technical Preservation Services, U.S. Department of the Interior, 1982.